"Now keeping always our respect for moderation in grave piety, we ought not to believe anything inadvisedly on a dubious point, lest in favor to our error we conceive a prejudice against something that truth hereafter may reveal to be not contrary in any way to the sacred books of either the Old or the New Testament." I should pay no more attention to them than to those who previously contradicted me - at whom I always laugh, being assured of the eventual outcome - were it not that in their new calumnies and persecutions I perceive that they do not stop at proving themselves more learned than I am (a claim which I scarcely contest), but go so far as to cast against me the imputations of crimes which must be, and are, more abhorrent to me than death itself. I cannot remain satisfied merely to know that the injustice of this is recognized by those who are acquainted with these men and with me, as perhaps it is not known to others. First they have endeavored to spread the opinion that such propositions in general are contrary to the Bible and are consequently damnable and heretical. They know that it is human nature to take up causes whereby a man may oppress his neighbor, no matter how unjustly, rather than those from which a man may receive some just encouragement. Hence they have had no trouble in finding men who would preach the damnability and heresy of the new doctrine from their very pulpits with unwonted confidence, thus doing impious and inconsiderate injury not only to that doctrine and its followers but to all mathematics and mathematicians in general. Next, becoming bolder, and hoping (though vainly) that this seed which first took root in their hypocritical minds would send out branches and ascend to heaven, they began scattering rumors among the people that before long this doctrine would be condemned by the supreme authority. They know, too, that official condemnation would not only suppress the two propositions which I have mentioned, but would render damnable all other astronomical and physical statements and observations that have any necessary relation or connection with these. Now as to the false aspersions which they so unjustly seek to cast upon me, I have thought it necessary to justify myself in the eyes of all men, whose judgment in matters of` religion and of reputation I must hold in great esteem. I shall therefore discourse of the particulars which these men produce to make this opinion detested and to have it condemned not merely as false but as heretical. To this end they make a shield of their hypocritical zeal for religion. They go about invoking the Bible, which they would have minister to their deceitful purposes. Contrary to the sense of the Bible and the intention of the holy Fathers, if I am not mistaken, they would extend such authorities until even in purely physical matters - where faith is not involved - they would have us altogether abandon reason and the evidence of our senses in favor of some biblical passage, though under the surface meaning of its words this passage may contain a different sense. Such are the people who labor to persuade us that an author like Copernicus may be condemned without being read, and who produce various authorities from the Bible, from theologians, and from Church Councils to make us believe that this is not only lawful but commendable. Since I hold these to be of supreme authority I consider it rank temerity for anyone to contradict them - when employed according to the usage of the holy Church. Yet I do not believe it is wrong to speak out when there is reason to suspect that other men wish, for some personal motive, to produce and employ such authorities for purposes quite different from the sacred intention of the holy Church. With regard to this argument, I think in the first place that it is very pious to say and prudent to affirm that the holy Bible can never speak untruth - whenever its true meaning is understood. But I believe nobody will deny that it is often very abstruse, and may say things which are quite different from what its bare words signify. Hence in expounding the Bible if one were always to confine oneself to the unadorned grammatical meaning, one might fall into error. Not only contradictions and propositions far from true might thus be made to appear in the Bible, but even grave heresies and follies. Thus it would be necessary to assign to God feet, hands and eyes, as well as corporeal and human affections, such as anger, repentance, hatred, and sometimes even the forgetting of` things past and ignorance of those to come. These propositions uttered by the Holy Ghost were set down in that manner by the sacred scribes in order to accommodate them to the capacities of the common people, who are rude and unlearned. For the sake of those who deserve to be separated from the herd, it is necessary that wise expositors should produce the true senses of such passages, together with the special reasons for which they were set down in these words. This doctrine is so widespread and so definite with all theologians that it would be superfluous to adduce evidence for it. "It is likewise commonly asked what we may believe about the form and shape of the heavens according to the Scriptures, for many contend much about these matters. But with superior prudence our authors have forborne to speak of this, as in no way furthering the student with respect to a blessed life - and, more important still, as taking up much of that time which should be spent in holy exercises. What is it to me whether heaven, like a sphere surrounds the earth on all sides as a mass balanced in the center of the universe, or whether like a dish it merely covers and overcasts the earth? Belief in Scripture is urged rather for the reason we have often mentioned; that is, in order that no one, through ignorance of divine passages, finding anything in our Bibles or hearing anything cited from them of such a nature as may seem to oppose manifest conclusions, should be induced to suspect their truth when they teach, relate, and deliver more profitable matters. Hence let it be said briefly, touching the form of heaven, that our authors knew the truth but the Holy Spirit did not desire that men should learn things that are useful to no one for salvation." From these things it follows as a necessary consequence that, since the Holy Ghost did not intend to teach us whether heaven moves or stands still, whether its shape is spherical or like a discus or extended in a plane, nor whether the earth is located at its center or off to one side, then so much the less was it intended to settle for us any other conclusion of the same kind. And the motion or rest of the earth and the sun is so closely linked with the things just named, that without a determination of the one, neither side can be taken in the other matters. Now if the Holy Spirit has purposely neglected to teach us propositions of this sort as irrelevant to the highest goal (that is, to our salvation), how can anyone affirm that it is obligatory to take sides on them, that one belief is required by faith, while the other side is erroneous? Can an opinion be heretical and yet have no concern with the salvation of souls? Can the Holy Ghost be asserted not to have intended teaching us something that does concern our salvation? I would say here something that was heard from an ecclesiastic of the most eminent degree: "That the intention of the Holy Ghost is to teach us how one goes to heaven, not how heaven goes." "We must also take heed, in handling the doctrine of Moses, that we altogether avoid saying positively and confidently anything which contradicts manifest experiences and the reasoning of philosophy or the other sciences. For since every truth is in agreement with all other truth, the truth of Holy Writ cannot be contrary to the solid reasons and experiences of human knowledge." "If anyone shall set the authority of Holy Writ against clear and manifest reason, he who does this knows not what he has undertaken; for he opposes to the truth not the meaning of the Bible, which is beyond his comprehension, but rather his own interpretation, not what is in the Bible, but what he has found in himself and imagines to be there." We have it from the very mouth of the Holy Ghost that God delivered up the world to disputations, so that man cannot find out the work that God hath done from the beginning even to the end. In my opinion no one, in contradiction to that dictum, should close the road to free philosophizing about mundane and physical things, as if everything had already been discovered and revealed with certainty. Nor should it be considered rash not to be satisfied with those opinions which have become common. No one should be scorned in physical disputes for not holding to the opinions which happen to please other people best, especially concerning problems which have been debated among the greatest philosophers for thousands of years. 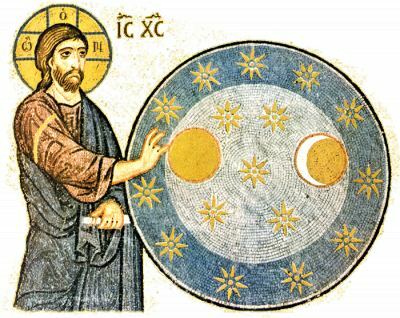 One of these is the stability of the sun and mobility of the earth, a doctrine believed by Pythagoras and all his followers, by Heracleides of Pontus (who was one of them), by Philolaus, the teacher of Plato, and by Plato himself according to Aristotle. Plutarch writes in his Life of Numa that Plato, when he had grown old, said it was absurd to believe otherwise. The same doctrine was held by Aristarchus of Samos, as Archimedes tells us; by Seleucus the mathematician, by Nicetas the philosopher (on the testimony of Cicero), and by many others. Finally this opinion has been amplified and confirmed with many observations and demonstrations by Nicholas Copernicus. And Seneca, a most eminent philosopher, advises us in his book on comets that we should more diligently seek to ascertain whether it is in the sky or in the earth that the diurnal rotation resides. "This is ventured upon, lacerated, and taught by the garrulous old woman, the doting old man, and the prattling sophist before they have learned it. Others, led on by pride, weigh heavy words and philosophize amongst women concerning holy Scripture. Others - oh shame!- learn from women what they teach to men, and (as if that were not enough) glibly expound to others that which they themselves do not understand. I forebear to speak of those of my own profession who, attaining a knowledge of the holy Scriptures after mundane learning, tickle the ears of the people with affected and studied expressions, and declare that everything they say is to be taken as the law of God. Not bothering to learn what the prophets and the apostles have maintained, they wrest incongruous testimonies into their own senses - as if distorting passages and twisting the Bible to their individual and contradictory whims were the genuine way of teaching, and not a corrupt one." Now the physical conclusions in which they say we ought to be satisfied by Scripture, without glossing or expounding it in senses different from the literal, are those concerning which the Bible always speaks in the same manner and which the holy Fathers all receive and expound in the same way. But with regard to these judgments I have had occasion to consider several things, and I shall set them forth in order that I may be corrected by those who understand more than I do in these matters - for to their decisions I submit at all times. Let us grant then that theology is conversant with the loftiest divine contemplation, and occupies the regal throne among sciences by dignity. But acquiring the highest authority in this way, if she does not descend to the lower and humbler speculations of the subordinate sciences and has no regard for them because they are not concerned with blessedness, then her professors should not arrogate to themselves the authority to decide on controversies in professions which they have neither studied nor practiced. Why, this would be as if an absolute despot, being neither a physician nor an architect but knowing himself free to command, should undertake to administer medicines and erect buildings according to his whim - at grave peril of his poor patients' lives, and the speedy collapse of his edifices. From the above words I conceive that I may deduce this doctrine That in the books of the sages of this world there are contained some physical truths which are soundly demonstrated, and others that are merely stated; as to the former, it is the office of wise divines to show that they do not contradict the holy Scriptures. And as to the propositions which are stated but not rigorously demonstrated, anything contrary to the Bible involved by them must be held undoubtedly false and should be proved so by every possible means. 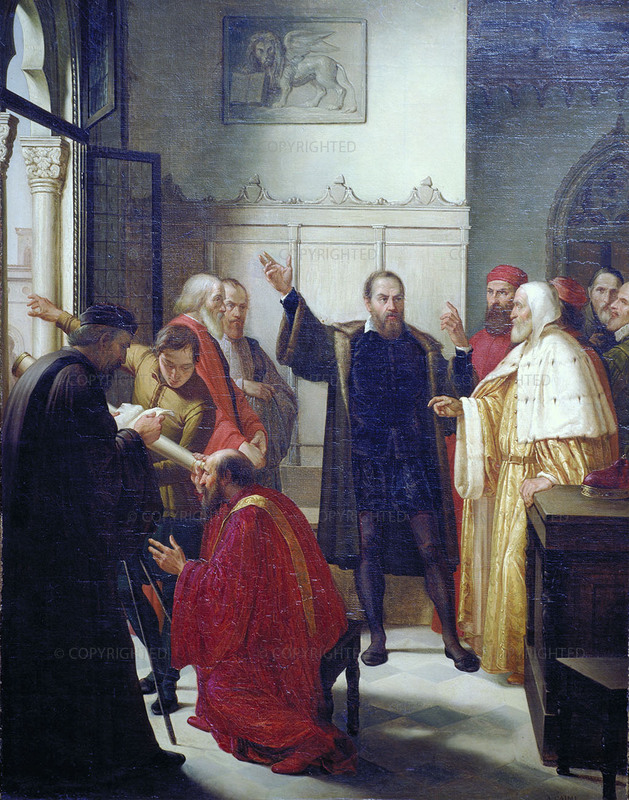 Now if truly demonstrated physical conclusions need not be subordinated to biblical passages, but the latter must rather be shown not to interfere with the former, then before a physical proposition is condemned it must be shown to be not rigorously demonstrated - and this is to be done not by those who hold the proposition to be true, but by those who judge it to be false. This seems very reasonable and natural, for those who believe an argument to be false may much more easily find the fallacies in it than men who consider it to be true and conclusive. Indeed, in the latter case it will happen that the more the adherents of an opinion turn over their pages, examine the arguments, repeat the observations, and compare the experiences, the more they will be confirmed in that belief. And Your Highness knows what happened to the late mathematician of the University of Pisa who undertook in his old age to look into the Copernican doctrine in the hope of` shaking its foundations and refuting it, since he considered it false only because he had never studied it. As it fell out, no sooner had he understood its grounds, procedures, and demonstrations than he found himself persuaded, and from an opponent he became a very staunch defender of it. I might also name other mathematicians who, moved by my latest discoveries, have confessed it necessary to alter the previously accepted system of the world, as this is simply unable to subsist any longer. Your Highness may thus see how irregularly those persons proceed who in physical disputes arrange scriptural passages (and often those ill­-understood by them) in the front rank of their arguments. If these men really believe themselves to have the true sense of a given passage, it necessarily follows that they believe they have in hand the absolute truth of the conclusion they intend to debate. Hence they must know that they enjoy a great advantage over their opponents, whose lot it is to defend the false position; and he who maintains the truth will have many sense­ experiences and rigorous proofs on his side, whereas his antagonist cannot make use of anything but illusory appearances, quibbles, and fallacies. Now if these men know they have such advantages over the enemy even when they stay within proper bounds and produce no weapons other than those proper to philosophy, why do they, in the thick of the battle, betake themselves to a dreadful weapon which cannot be turned aside, and seek to vanquish the opponent by merely exhibiting it? If I may speak frankly, I believe they have themselves been vanquished, and, feeling unable to stand up against the assaults of the adversary, they seek ways of holding him off. To that end they would forbid him the use of reason, divine gift of Providence, and would abuse the just authority of holy Scripture - which, in the general opinion of theologians, can never oppose manifest experiences and necessary demonstrations when rightly understood and applied. If I am correct, it will stand them in no stead to go running to the Bible to cover up their inability to understand (let alone resolve) their opponents' arguments, for the opinion which they fight has never been condemned by the holy Church. If they wish to proceed in sincerity, they should by silence confess themselves unable to deal with such matters. Let them freely admit that although they may argue that a position is false, it is not in their power to censure a position as erroneous - or in the power of any­one except the Supreme Pontiff, or the Church Councils. Reflecting upon this, and knowing that a proposition cannot be both true and heretical, let them employ themselves in the business which is proper to them; namely, demonstrating its falsity. And when that is revealed, either there will no longer be any necessity to prohibit it (since it will have no followers), or else it may safely be prohibited without the risk of any scandal. Therefore let these men begin to apply themselves to an examination of the arguments of Copernicus and others, leaving condemnation of the doctrine as erroneous and heretical to the proper authorities. Among the circumspect and most wise Fathers, and in the absolute wisdom of one who cannot err, they may never hope to find the rash decisions into which they allow themselves to be hurried by some particular passion or personal interest. With regard to this opinion, and others which are not directly matters of faith, certainly no one doubts that the Supreme Pontiff has always an absolute power to approve or condemn; but it is not in the power of any created being to make things true or false, for this belongs to their own nature and to fact. Therefore in my judgment one should first be assured of the necessary and immutable truth of the fact, over which no man has power. This is wiser counsel than to condemn either side in the absence of such certainty, thus depriving oneself of continued authority and ability to choose by determining things which are now undetermined and open and still lodged in the will of supreme authority. And in brief, if it is impossible for a conclusion to be declared heretical while we remain in doubt as to its truth, then these men are wasting their time clamoring for condemnation of the motion of the earth and stability of the sun, which they have not yet demonstrated to be impossible or false ….